This fabulous 4 bedroom home has all the charm and characteristics you would expect from a quality built seventies home. The front lobby bestows the warmth of timbers, brick and slate as you enter into the inviting lounge and dining area with bluestone open fireplace. The large master bedroom has a cedar lined ensuite with separate toilet and WIR. Three other bedrooms at the rear of the home share a “groovy” seventies style bathroom complete with spa. A delightful white kitchen with separate meals area and adjoining sitting room with gas log fire (which the owners fondly refer to as “The snug”) overlook the rock gardens full of blooms. The paved veranda courtyard faces a sunbaking area with a tiled inground pool, spa and diving board. In addition to all this, a funky studio, which has been completely refurbished 12 months ago sits seamlessly beside the pool. This is a fully functioning self-contained suite (approximately 4.5 squares) which is currently attracting regular B & B guests and yielding 30k a year. Extras include 50,000 litre underground tank & pump, intercom system, double carport and storeroom. The property is set on an immaculate 2673 sqm piece of land with glimpses of Port Phillip Bay. 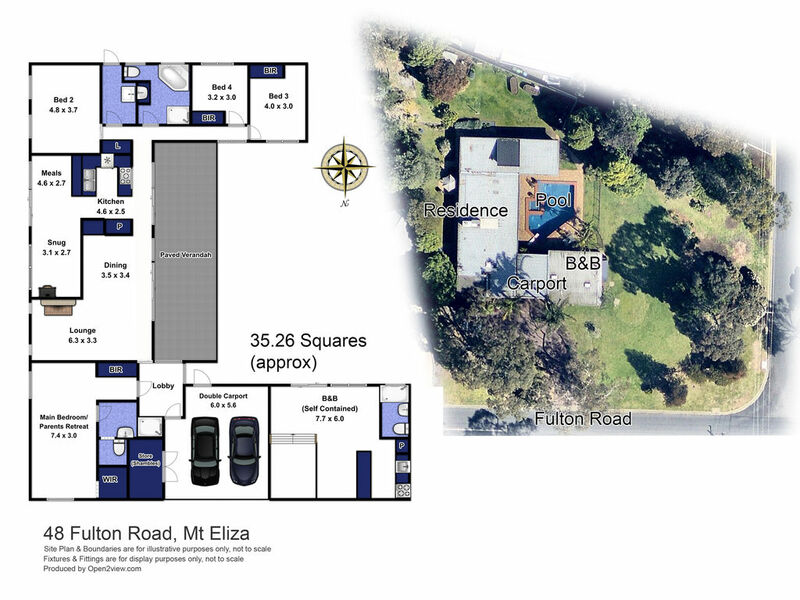 Situated in the appealing Fulton Road area and within walking distance to Mt Eliza North Primary school.